This article is about the book. For the film, see The Bridges of Madison County (film). For the musical, see The Bridges of Madison County (musical). For the bridges, see List of Madison County Covered Bridges. Without expecting to, Robert James Waller conceived of The Bridges of Madison County in the early 1990s. On leave from his teaching job at the University of Northern Iowa, Waller was photographing the Mississippi River with a friend when he decided to photograph Madison County, Iowa's, covered bridges. This event, alongside a song Waller wrote years earlier about "the dreams of a woman named Francesca," gave him the idea for the novella, which was completed in eleven days. After he had written Bridges, Waller came to believe that he had based the character of Francesca Johnson on his wife, Georgia, whom Francesca physically resembles. According to Marc Eliot, Waller's novella is a modernization of the Noël Coward play Still Life (1934), which was adapted into David Lean's film Brief Encounter (1945). Still Life is about "the desperation, guilt, and temptations of two married people who meet, fall in love, commit adultery, and then separate forever." In The New York Times, Brigitte Weeks said that Bridges had appealed to "middle-aged, world-weary people" in a manner similar to the writings of James A. Michener, though it features more sexuality than Michener's books. 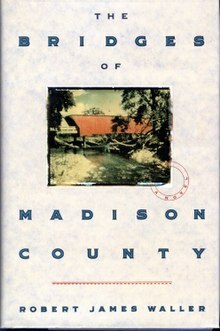 The Bridges of Madison County received multiple comparisons to Erich Segal's Love Story (1970) for its plot and prose. For Rolling Stone, Peter Travers said that Waller's prose was modeled on Walt Whitman's work, but instead resembled a greeting card. Travers also said that Bridges exists within a tradition of "great romantic crocks" like Pat Conroy's The Prince of Tides (1986). The New York Times Magazine found the novella's prose comparable to that of Jonathan Livingston Seagull (1970) by Richard Bach. The Independent's Nicolette Jones found the novella reminiscent of the books published by Mills & Boon while Owen Gleiberman found it more similar to an anecdote than a regular narrative. Orlando Sentinel Publishers Weekly found The Bridges of Madison County "Quietly powerful and thoroughly credible". L.S. Klepp of Entertainment Weekly called Bridges "a short, poignant story, moving precisely because it has the ragged edges of reality". Roger Ebert of the Chicago Sun-Times praised the novella's "compelling" story for "elevating to a spiritual level the common fantasy in which a virile stranger materializes in the kitchen of a quiet housewife and takes her into his arms." The book debuted on the New York Times bestseller list in August 1992 and slowly climbed to number 1, and remained on the list for over three years (164 consecutive weeks), through October 8, 1995. The Bridges of Madison County was made into a 1995 film of the same name, adapted by Richard LaGravenese and directed by Clint Eastwood. It stars Eastwood and Meryl Streep. The Bridges of Madison County was adapted into a Tony Award-winning musical with music and lyrics by Jason Robert Brown and the book by Marsha Norman. The musical premiered at the Williamstown Theatre Festival on August 1, 2013. Directed by Bartlett Sher, the cast featured Elena Shaddow as Francesca and Steven Pasquale. The musical began previews on Broadway at the Gerald Schoenfeld Theatre on January 17, 2014 and officially opened on February 20, 2014 with Kelli O'Hara as Francesca and Steven Pasquale as Robert Kincaid. Directed by Bartlett Sher, the sets are by Michael Yeargan, costumes by Catherine Zuber, and lighting by Donald Holder. Hunter Foster played the role of Bud Johnson, the husband of Francesca. In 2018, the Argentine theatrical director Luis "Indio" Romero directed the famous actors Facundo Arana and Araceli González in a Spanish version of the famous work. ^ a b Jones, Nicolette (October 10, 1993). "BOOK REVIEW / Cowbore of yesteryear: 'The Bridges of Madison County' - Robert James Waller: Mandarin, 3.99 pounds". The Independent. Retrieved September 9, 2018. ^ a b c d Grimes, William (March 10, 2017). "Robert James Waller, Author of 'The Bridges of Madison County,' Dies at 77". The New York Times. Retrieved September 9, 2018. ^ a b Gleiberman, Owen (June 9, 1995). "The Bridges of Madison County". Entertainment Weekly. Retrieved September 9, 2018. ^ Daniel S., Levine (March 10, 2017). "Robert James Waller Dead: 5 Fast Facts You Need to Know". Heavy.com. Retrieved September 9, 2018. ^ Eliot 2009, pp. 291. ^ a b Travers, Peter (June 2, 1995). "The Bridges of Madison County". Rolling Stone. Retrieved September 9, 2018. ^ "The Bridges of Madison County". Publishers Weekly. Retrieved September 10, 2018. ^ Klepp, L.S. "BOOK REVIEW: The Bridges of Madison County" June 12, 1992. ^ Ebert, Roger (June 2, 1995). "The Bridges of Madison County". Chicago Sun-Times. Retrieved September 10, 2018. ^ "The Tony Award Nominees - Shows - TonyAwards.com - The American Theatre Wing's Tony Awards® - Official Website by IBM". TonyAwards.com. 2014-02-18. Retrieved 2014-07-04.